We look forward to returning to Lumholtz Lodge after visiting a few years before. 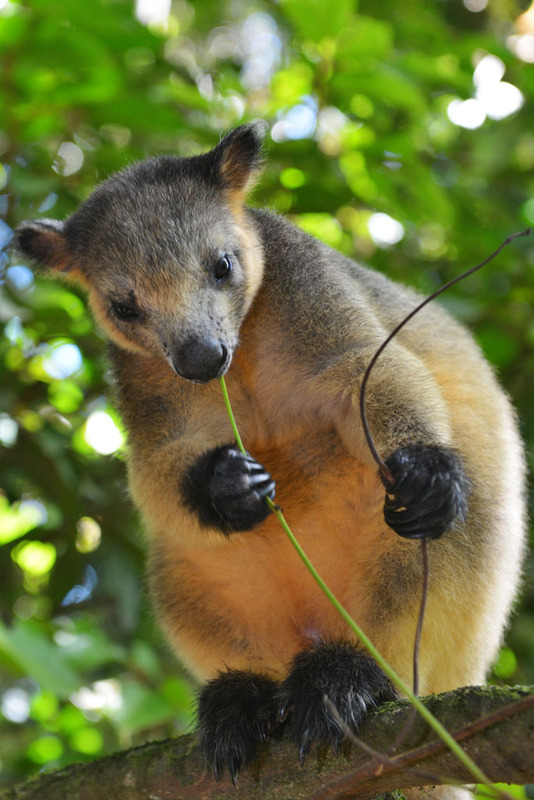 During our last visit, we met Geoffrey the adorable tree kangaroo made famous by photographers and wildlife publications from around the world. Tree Kangaroos are notoriously hard to spot in the wild, so many photographers and wildlife enthusiasts travel to Lumholtz Lodge where they have a chance of seeing them up close. 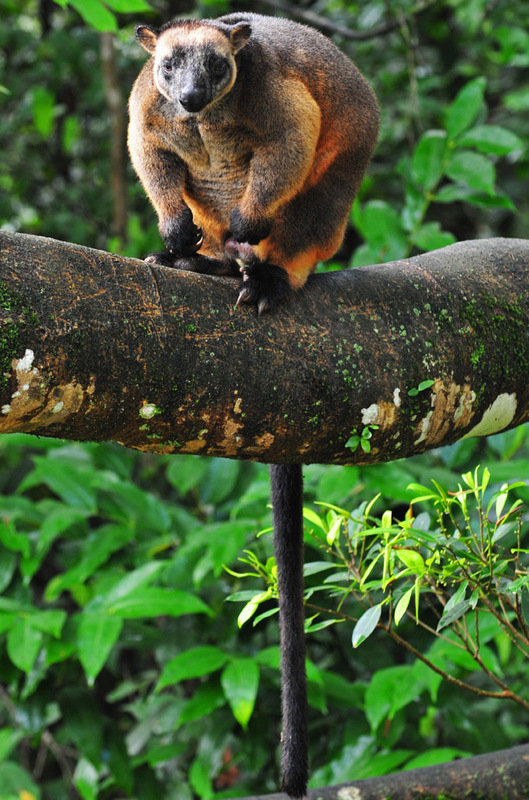 Lumholtz tree kangaroos live in the rainforest in Far North Queensland in the Atherton Tablelands areas. These unique animals generally have soft black-brown fur that is often tinged with orange, small ears and a distinctive broad head with a black face and a pale band across the forehead. Babies and younger juveniles faces are more of a patchy black. 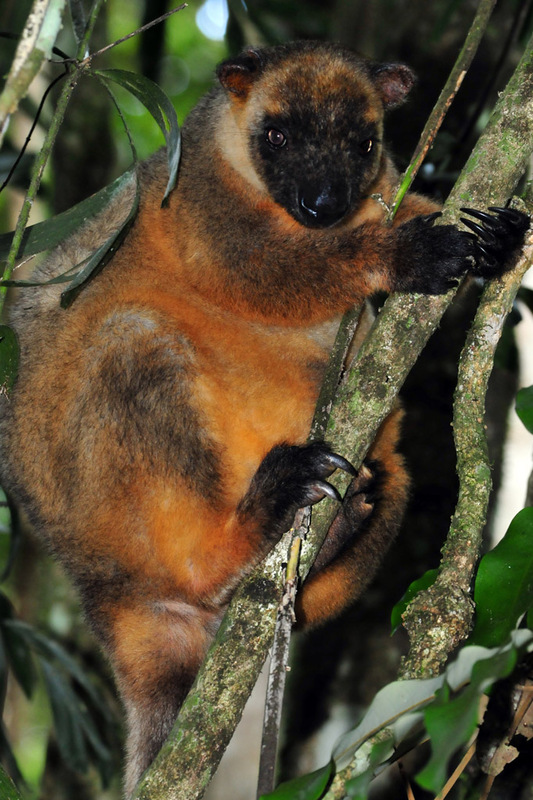 Lumholtz tree kangaroos inhabit upland rainforest. Adults weigh up to 10 kg and they have muscly arms for climbing trees and a long black tail used to keep balance while high in the trees. 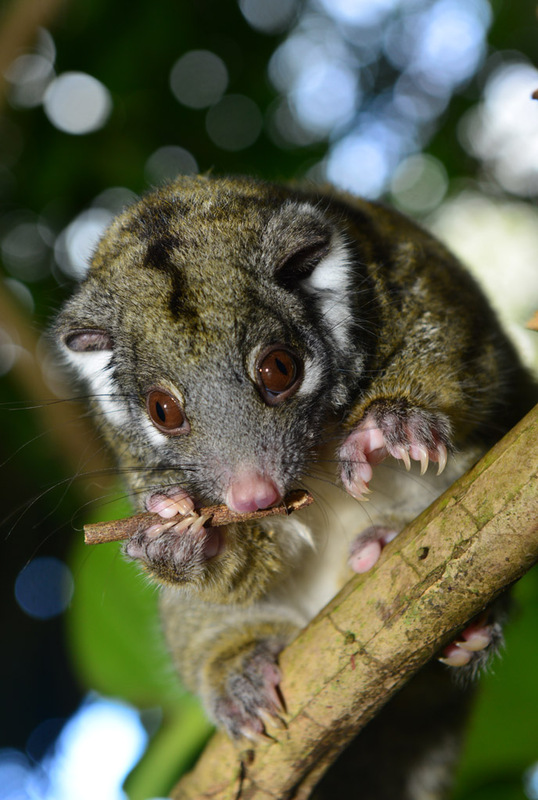 They eat leaves, vines and fruits of the rainforest. 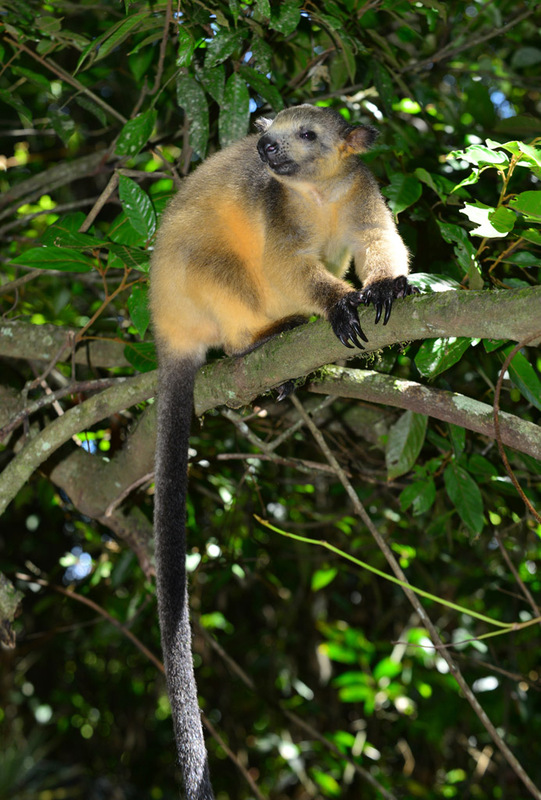 Usually, they move along the treetops but will go to the ground when changing trees or to eat low-hanging fruit. 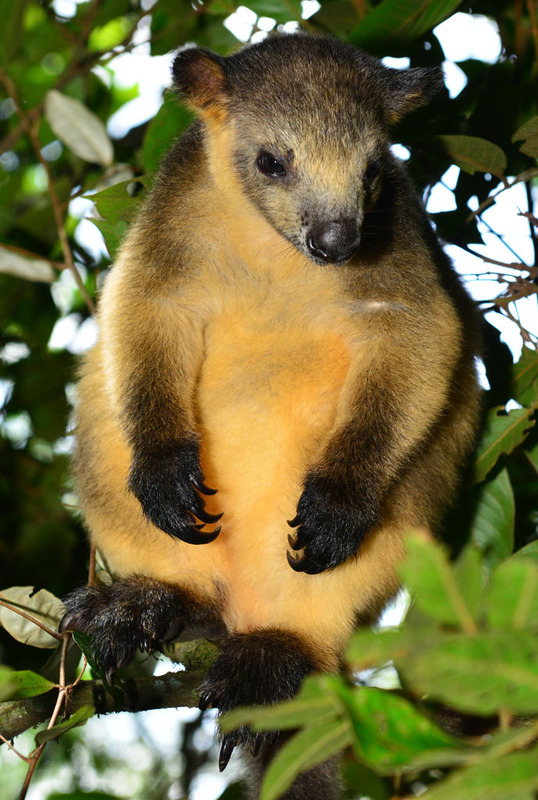 Tree kangaroos are nocturnal and solitary. Males show aggression when others enter their territory which is about 5 acres for males and 1.5 acres for females. Females are sexually mature at about 2 years old. They carry their young in their pouch for about 9 months and once out of the pouch they can take another 9 months to be weaned. After this, they stay with mum for another year or more. 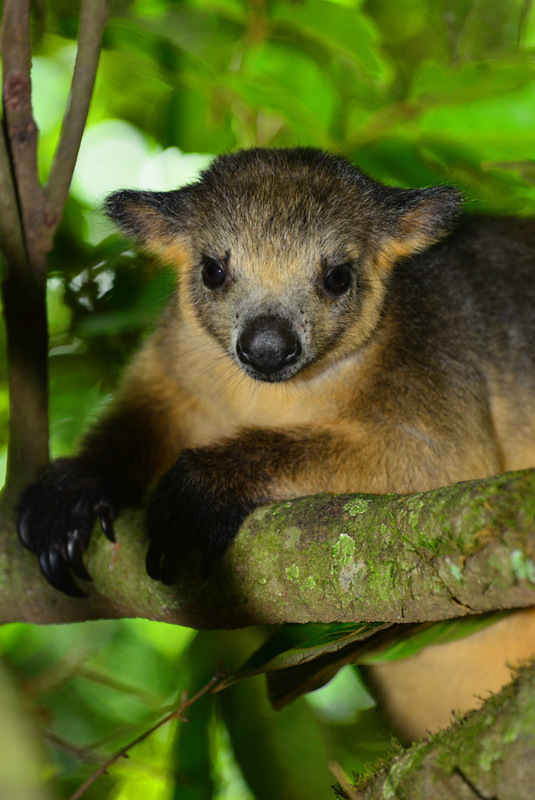 The Lumholtz tree kangaroo is rare and their future is threatened by deforestation. The extensive clearing of rainforest greatly reduces their habitat and puts them at risk from domesticated and wild dogs and being run over by cars when moving on the ground between patches of rainforest. Climate change also poses a threat in the longer term. 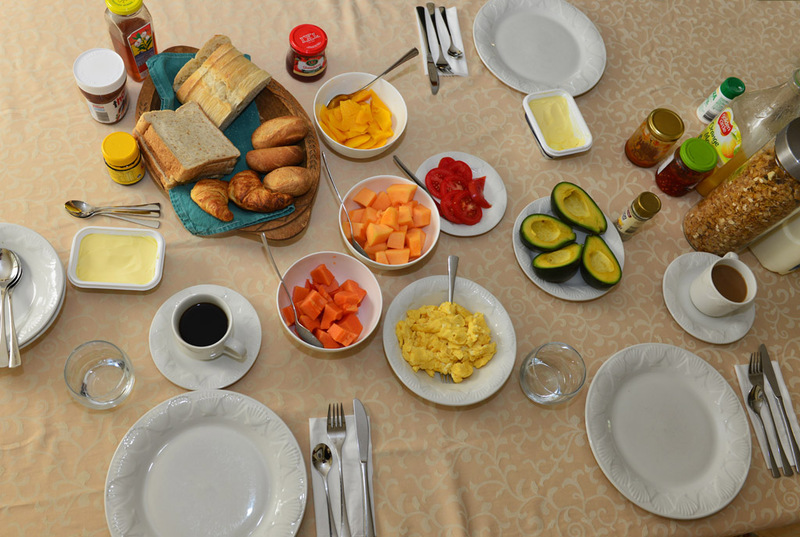 Nestled in the tropical rainforest outside of Atherton in Queensland, Lumholtz Lodge is an intimate bed and breakfast where only one lot of guests are booked in at one time, which makes it an exclusive and personal experience. Visitors can immerse themselves in nature and the wildlife from the rainforest. Margit the host is a dedicated wildlife carer who specialises in the endemic Lumholtz tree kangaroo. Her extensive knowledge of the rainforest and the unique wildlife around the lodge makes for a special stay. 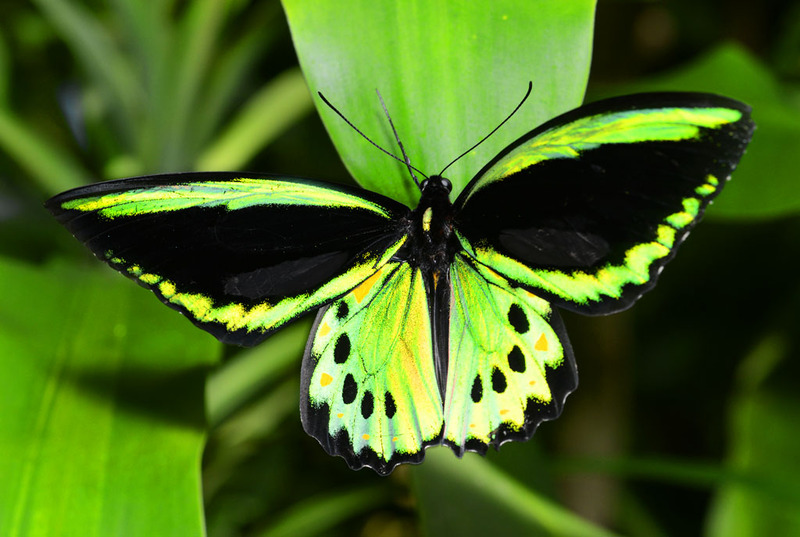 Nature at its finest – Cairns Birdwing Butterfly. 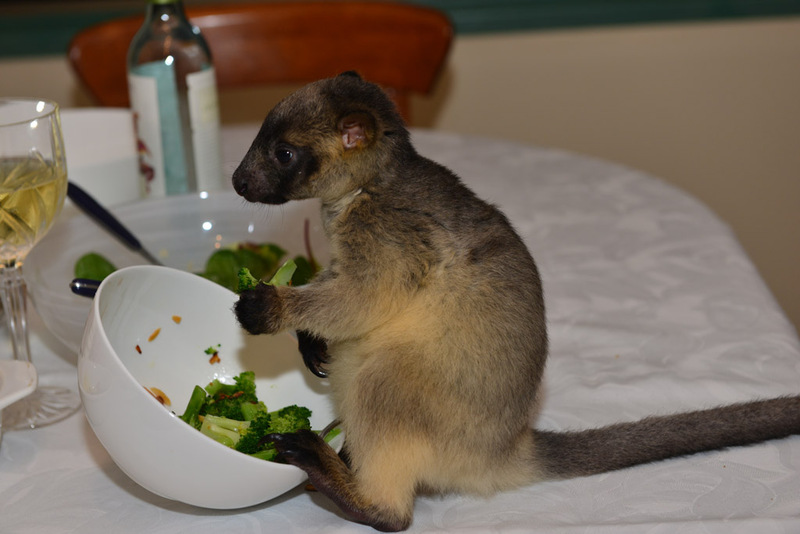 Dobby is the cutest 6-month-old baby tree kangaroo. While spotlighting in the national park scientists found him almost dead on the ground. He was so thin at only 370 grams, very dehydrated and on his own for some time. Named after the character of the elf in Harry Potter, he is so friendly, full of beans and a little trouble maker. Before long he jumps on us and sits on our shoulder. Nelson who is 16 months old came into care at about 6 months old only weighing 400 grams. He has the most beautiful and gentle nature. Slowly familiarising with the wild, Nelson spends time during the day playing in the rainforest beside the lodge. Kimberly who is now four years old came into Margit’s care after two local boys heard a splash and went to investigate and found the baby had fallen out of a tree and landed in a creek. They found her motionless on the bottom and rescued her. After cared for and rehabilitated by Margit for a couple of years she slowly spent more time in the rainforest and successfully acquainted herself back into the wild and has a wild boyfriend called Gregory. She visits the lodge regularly and brings her 12-month-old baby Monty. Margit tells us it is a privilege to witness her as a first time mum and to still have Kimberly’s trust. Monty will stay with Kimberly until he is about three years old. 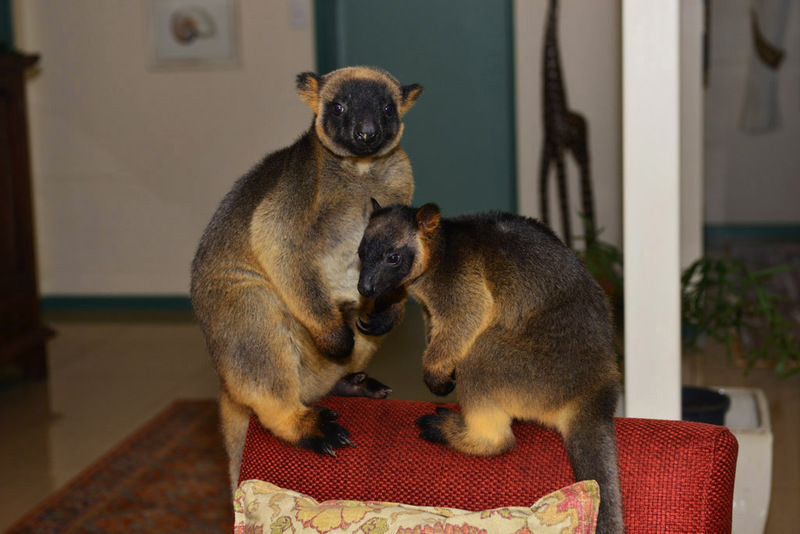 Lumholtz Lodge gives the tree kangaroos a chance to have a life in the wild. Margit greets us, serves cold drinks and a tasty cheese platter as we sit outside overlooking the rainforest. Towering palms, rainforest trees, ferns, orchards and climbing vines border the lodge and the only sounds we hear are the songs of rainforest birds, the golden whistler and bowerbirds. 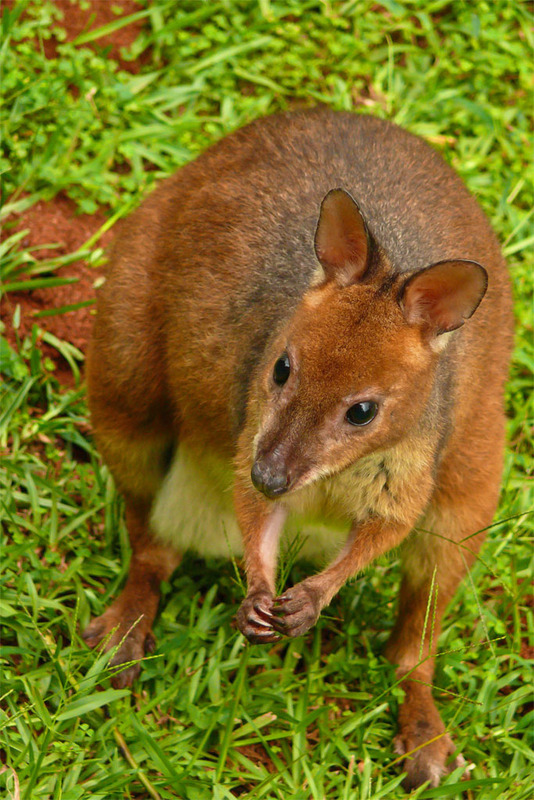 As the sun sets adorable pademelons venture out of the rainforest to graze on the green lawn of the lodge. Most of them are wild and many were once in Margit’s care and some bring their babies back to the lodge. Pademelons like the cover of the rainforest and rarely go very far from it. We are saddened to hear that Geoffrey was killed by domesticated dogs. Margit raised Geoffrey from an 8-month-old orphan and for the next 11 years, Lumholtz Lodge was his home base. Spending most of his time in the rainforest he would come and go from the lodge as he pleased and always keeping the strong bond with Margit. Kimberly and Monty visit the lodge during our stay and it is a sight to behold. At first, they are both very aloof and suspicious of us, but by the end of the night, they warm to us. The antics between these two and Dobby are so funny as they have the run of the house. Little Dobby chases and jumps on them. He is a stirrer and just a ball of energy. Margit tells us it is very rare for an adult female to accept another baby kangaroo, but Kimberly takes it all in her stride. Margit also currently looks after a baby rock wallaby, so tiny she has just started to grow some fur. 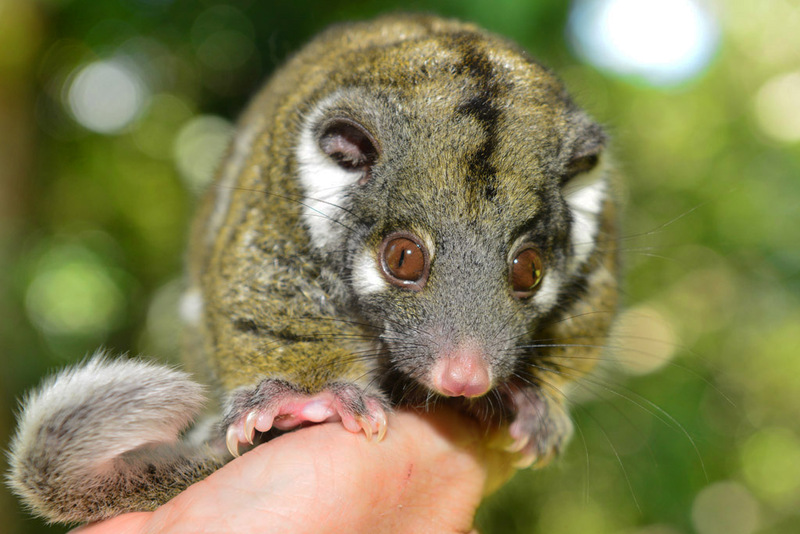 Another gorgeous and interesting personality is a baby green ringtail possum, a species of ringtail possum found only in Northern Australia. We get to feed him his favourite leaves and he loves sitting on top or our head as he would on his mum in the wild. Cheeky Dobby sneaks in for leftovers. The antics at Lumholtz Lodge are a once in a lifetime experience. Margit dishes up a lovely 3-course vegetarian dinner, including vegetables picked fresh from her garden. A dessert of mango sorbet topped with chocolate sauce completes the meal. All this time it’s like a movie playing in front of us as we watch the wildlife frolics in the lodge. A pademelon with a baby in her pouch hops into the lodge checks everything out and goes back outside. She is another one of Margit’s many past charges. 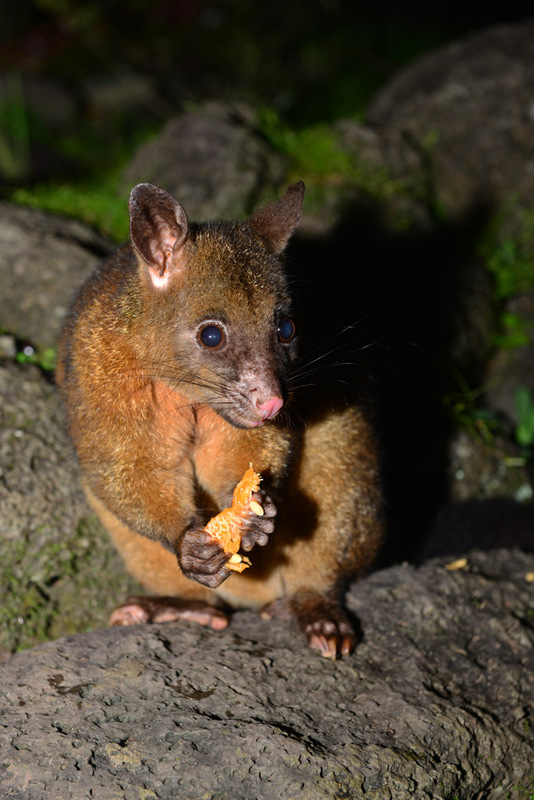 Outside pademelons and brushtail possums gather under the moonlit rainforest as they forage for food. 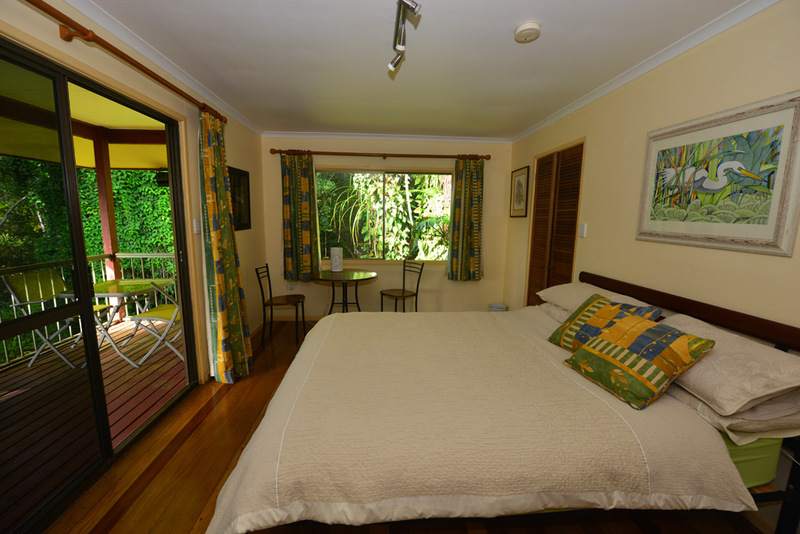 Our snug bedroom overlooks the rainforest and from our veranda, we watch the pademelons and possums. We leave our window open to the cool air of the rainforest so we can listen to the distinctive mee-ow call of the rainforest catbird. Because of the elevation, it can get quite cool here and very cold at night in winter. In the morning over our tropical breakfast, a colourful display of rainbow lorikeets and king parrots clown around and play outside the rainforest in front of the lodge. This tops off our stay at wildlife paradise. If you are looking for a stay in a rainforest with an opportunity to experience rare wildlife encounters, Lumholtz Lodge is the place to go. Margit is an interesting host with great stories to tell and knows all about the area and can advise on other places to visit during your stay. Lumholtz Lodge is a chance to get close to unique wildlife. They rest high in the tree canopies during the day and can be difficult to spot. Their long black tail that often hangs down can be the best clue. Overcast and drizzling rain is a good time to spot them as they come to the edges of the branches rather than hide under dense foliage. Late afternoon and early evening are a good time to spot them as it’s the start of the active night period when they leave their day spots. Try to get on higher terrain so you are looking horizontally into the trees rather than straight up. Wear neutral coloured clothes. No bright colours or fluorescents. No sudden quick movement and be as quiet as possible. You will often see their long tail first. Crater Lakes National Park – This park is in two sections, each one around one of the two crater lakes – Lake Eacham and Lake Barrine. 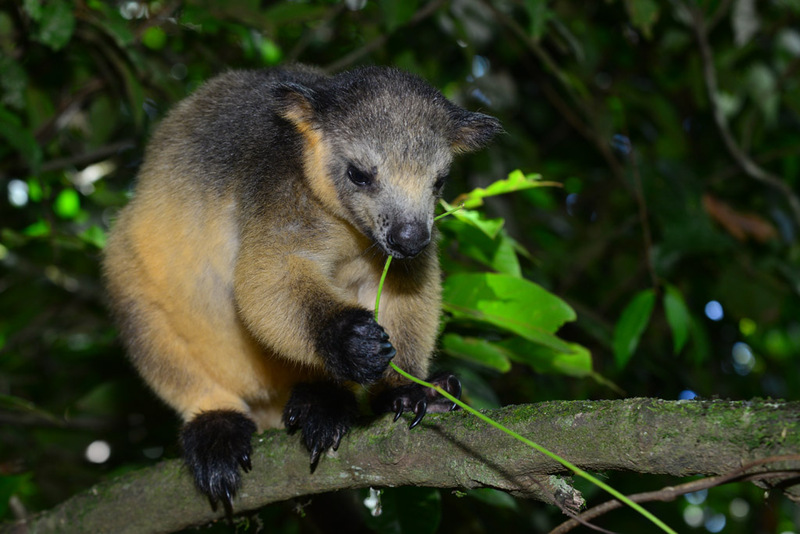 Tree kangaroos, the Ulysses butterfly, rare possums and frogs are some of the wildlife that’s possible to spot here. Curtain Fig National Park – The vegetation here is mabi forest (critically endangered vine forest) which Lumholtz tree kangaroos love. Green ringtail possums also inhabit this area. Malanda Falls ­– In the small section of rainforest around Malanda Falls there is a good chance of seeing tree kangaroos. Malanda Falls Visitor Centre is also here, which is very informative about things to do in the area. We spot this girl at Malanda Falls. Mt Quincan Crater Retreat – Luxurious tree houses set in the rainforest which is home to the tree kangaroos and other wildlife which are sometimes seen from the tree houses. 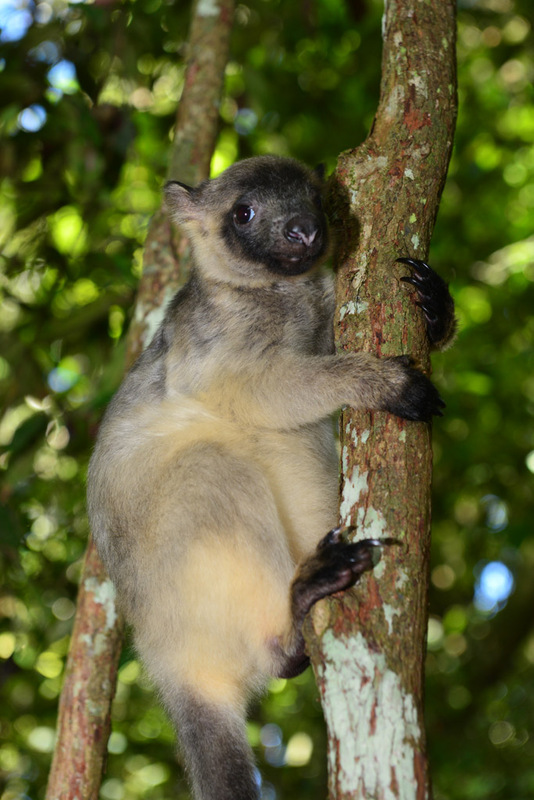 Nerada Tea Plantation – A lot of tree kangaroos sighting here, but please visit the plantation and have a cup of tea too! Peterson Creek area near Yungaburra – On the 2.3 km Peterson Creek walking track visitors sometimes spot tree kangaroos and platypus. 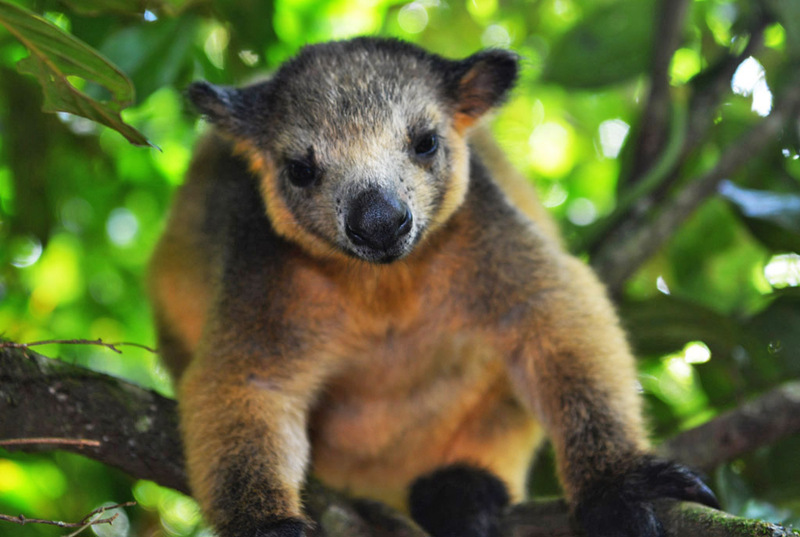 Alan’s Wildlife Tours – A naturalist and guide specialising in tree kangaroos, mammals and birds on the Atherton Tablelands. 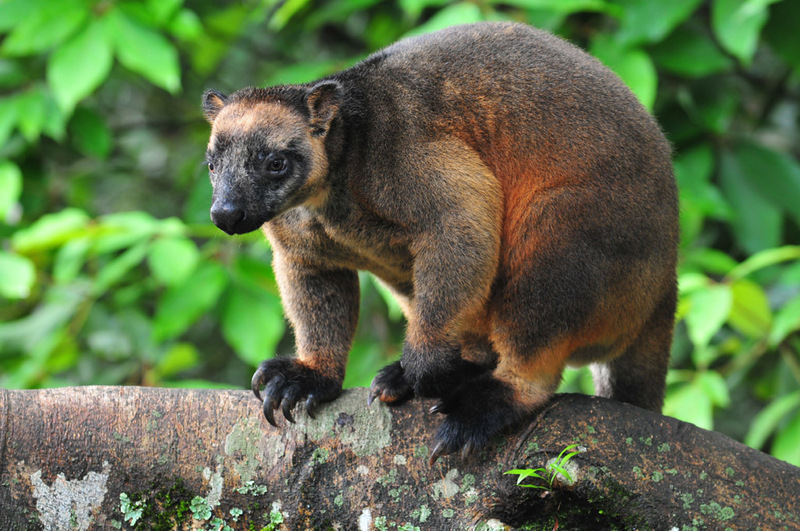 Lumholtz Lodge is a rare opportunity to see tree kangaroos. Read about our stay with the cassowaries at Cassowary House which is also in the area. It looks like the tablelands have so much to offer. 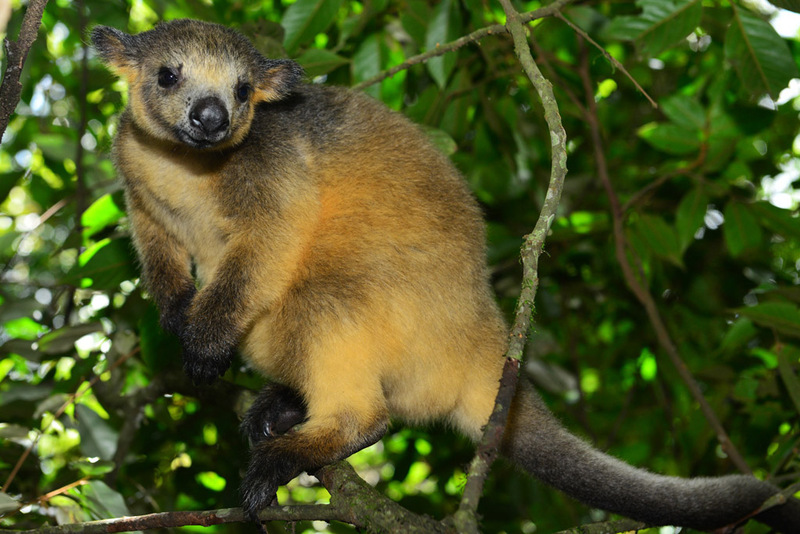 We saw our first platypus there but never learnt about these adorable tree kangaroos and possums. Cleary we need to return, a fantastic informative article with great images. Spotting a platypus would have been awesome. 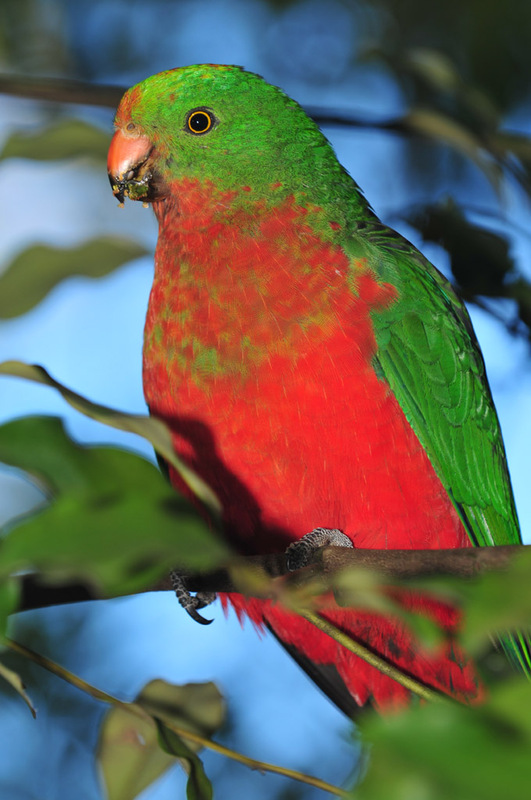 The Atherton Tablelands does have so much to offer in the way of wildlife. We can see why it’s one of David Attenborough’s favourite places in the world! Apart from wildlife, there are also some gorgeous waterfalls and swimming holes. We hope you make it back one day Hayley. Beautiful article and images. We have been in the area a few times now and saw a mother and baby around the Nerada but have never seen ant at Malanda Falls. Thanks for letting us know about the lodge as we have never heard of it before. We have friends coming from New Zealand who we will let know about this. Thanks for your comment Dee & James. Next time we visit, Nerada is on our list! Lumholtz Lodge is one of the best places anyone with an interest in wildlife can stay.